Beginning on November 6, 2007 and continuing for approximately three months, the Blue Ridge Parkway will be closed from Milepost 355.5 to 364.5, north of Mount Mitchell State Park. This closure is necessary for repairs being made to the Craggy Pinnacle Tunnel. 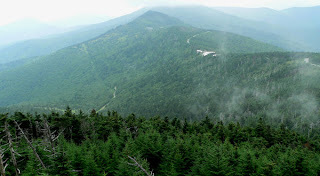 Mount Mitchell State Park is accessible from the north depending on winter weather conditions. Details can be found on the NPS website at www.nps.gov/blri and there is a link for weather and road conditions. Current road conditions are available by calling 828.298.0398. From the south, at the Folk Art Center at the entrance to the Parkway from Asheville, visitors traveling north encounter a large detour sign that directs them to I-40 East to exit 86 for Highway 226. If you want, you can get off I-40 earlier, at exit 72 (Old Fort) and can take US-70 to US-80 to the Parkway. Taking US-70 to US-80 is a beautiful drive to the Parkway at this point in time. For those of you who don’t know, at 6,684 feet, Mt Mitchell (below) is the highest peak of the Appalachians and the highest point east of the Mississippi. This entry was posted in Uncategorized and tagged Blue Ridge Parkway, Old Fort / Andrews Geyser by Inn on Mill Creek. Bookmark the permalink.